The left side of a matching pair, “Portiere Cascade I” was originally designed in the early 18th century in Lille. One can tell this by the addition of a French town in the distance, which weren’t added to verdures until then. Prior to that, verdures owned their distinctive look to the use of highly detailed foliage. That said, you can still enjoy the amazing attention to detail in this later verdure. The use of colors, combined with the exquisite attention to the littlest detail, is one of the reasons why verdures remain so popular, even to this day. The result is a tapestry with lots of depth and visual interest, tempered by the addition of more traditional landscape elements. All these elements combine to create a tapestry that’s truly a fine work of art. 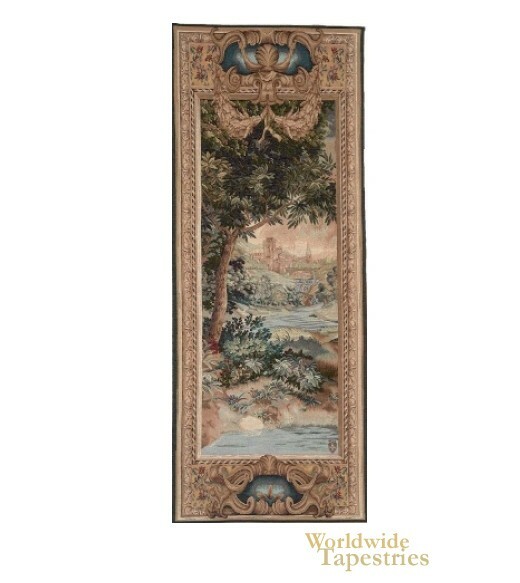 This tapestry is lined and has a tunnel for ease of hanging.